I want to be upfront about this. I didn’t make these. Calm down. I said calm down! 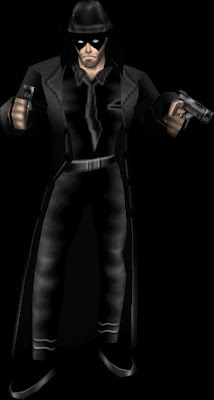 These were guest skins made by others during events on the Freedom Force Forums. I regret that I don’t know who made them anymore. This was made as a favor for another (much more talented) skinner by the name of Next Legend for whom I hexed together some animations. Sorry if that doesn’t mean much to you, but it’s how it went down. I was giddy when I received this. It was like Ewzzy had been sent to the Matrix. Too cool. This skin only makes sense if you know the secret origin of Ewzzy. As a character I had a secret identity running WZZY rock radio in Liberty City. For a re-imaging contest, another skinner created an alternate world me where I was born in England, loved cricket, and rand WZZY Sports Radio. The coolest part was the custom mesh they made so I could have a cricket bat. This was from the Amalgam contest where different forum members were combined into new characters. 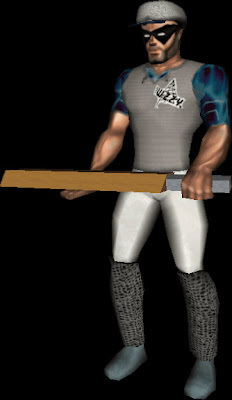 A forum member named ‘Agent’ was amalgamated with myself to create ‘Agent of E.W.Z.Z.Y’ as a brand new character. The idea being that in 40 years, when my vigilante work gets to be too much, I form a new crime fighting organization called E.W.Z.Z.Y. and that Agent’s son would be one of my recruits. Needless to say, I loved the idea.